Monkey Shoulder is a premium (triple malt) Scotch whiskey brought to us by William Grant & Sons (the makers of many other fine labels like Glenfiddich, Balvenie, and Tullamore Dew). Incidentally, Balvenie's Doublewood is an AMAZING Scotch and very reasonably priced. Grant also makes The Knot which I reviewed on this past St. Patrick’s Day's post. I could go on all day about William Grant & Sons’ products, there are so many, but back to Monkey Shoulder. 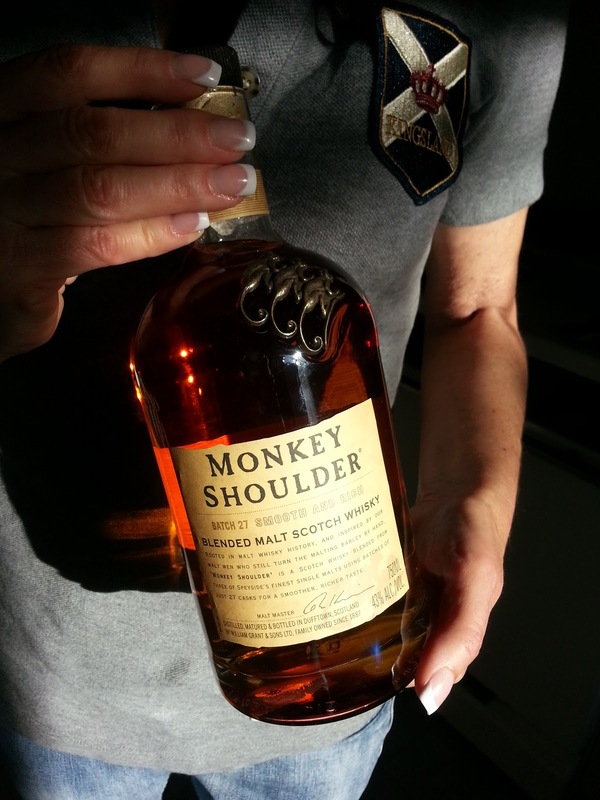 The name "monkey shoulder" comes from a temporary condition suffered by malt men as they turned the barley manually (apparently in the days before worker's comp cases and OSHA). Incidentally, according to the Monkey Shoulder website, their malt men still turn their barley manually, but under better working conditions so this injury no longer occur. Monkey Shoulder is a smooth and rich Scotch blended from three of William Grant & Sons' single malts (according to Buxton's book , Glenfiddich, Balvenie, and Kininvie) to produce this fine malt whiskey. It is a smooth, creamy, warm, and very malty Scotch that is not too peaty (which, as I have stated in other posts, I have not yet acquired a taste for). This is a delightful whiskey and, similar to Sheep Dip, it is very enjoyable for the those being introduced to Scotch. It works very well neat, on the rocks, or in whiskey cocktails. In fact, from looking at the overly hip, loud, and vibrating Monkey Shoulder website, it appears the "mixing market" is what they are targeting. However, Monkey Shoulder stands very well all on its own. Monkey Shoulder is widely available and reasonably priced. I recommend picking up a bottle and putting this monkey through the tasting regiment. If this very pleasant whiskey doesn't please, you can always try the many suggested cocktails on the Monkey Shoulder website.